Min S. Yun says that the LMT ... is uniquely suited for detecting a faint, broad line like this observational result and is designed specifically for this type of experiment. “Understanding how frequently the central supermassive black hole disrupts its host galaxy through a yet unknown energetic feedback process is one of the most important unanswered questions in the study of galaxy evolution today, and the LMT with its full 50-meter surface that was just completed, should yield more insights in the coming observing seasons,” he says. 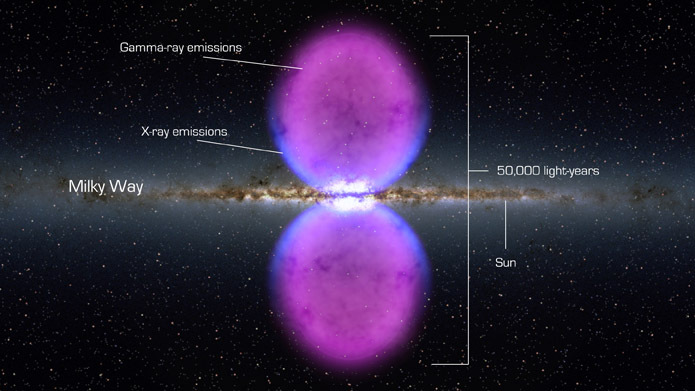 Giant gamma ray bubbles in the Milky Way. Just saying. I have long noticed that M82, which is undergoing a starburst in its center, seems to lack star formation in its disk altogether - due to its huge outflows of molecular gas? And our own galaxy displays two huge gamma ray bubbles on either side of the galactic plane, likely products of some violent event in the center of our galaxy, and, why not, remnants of some large scale outflow? The red sequnce, the green valley and the blue cloud. The galaxy color–magnitude diagram shows the relationship between absolute magnitude (a measure of luminosity) and mass of galaxies. A preliminary description of the three areas of this diagram was made in 2003 by Eric F. Bell et al. from the COMBO-17 survey that clarified the bimodal distribution of red and blue galaxies as seen in analysis of Sloan Digital Sky Survey data and even in de Vaucouleurs' 1961 analyses of galaxy morphology. Noticed in this diagram are three main features: the red sequence, the green valley, and the blue cloud. The red sequence includes most red galaxies which are generally elliptical galaxies. The blue cloud includes most blue galaxies which are generally spirals. In between the two distributions is an underpopulated space known as the green valley which includes a number of red spirals. The Milky Way and the Andromeda Galaxy are assumed to lie in the green valley because their star formation is slowing down due to running out of gas. It is possible that the Milky Way is running out of gas because of large-scale past outflows. <<"The Valley of the Jolly Green Giant" refers to the Minnesota River valley around Le Sueur. Today, just before dropping down into the valley heading south on U.S. Route 169 an enormous wooden sign of the Jolly Green Giant, along with the Little Green Sprout, is visible with the caption "Welcome to the Valley." stands a [COMBO-]17 m fiberglass statue of the Jolly Green Giant. <<The world's tallest statue monument with the height of 182 metres was inaugurated by the Prime Minister of India, Narendra Modi, on 31 October 2018 on the birth anniversary of the first deputy Prime Minister of India Bharat Ratna Sardar Vallabhbhai Patel. Sardar Vallabhbhai Patel, also known as the Iron Man of India, was a freedom fighter, senior leader, and one of the founding fathers of Republic of India. The statue is located on the river island called Sadhu Bet facing the Narmada Dam near Rajpipla in Indian state of Gujarat.